What does the #MPRraccoon have to do with modern fundraising? Everything. 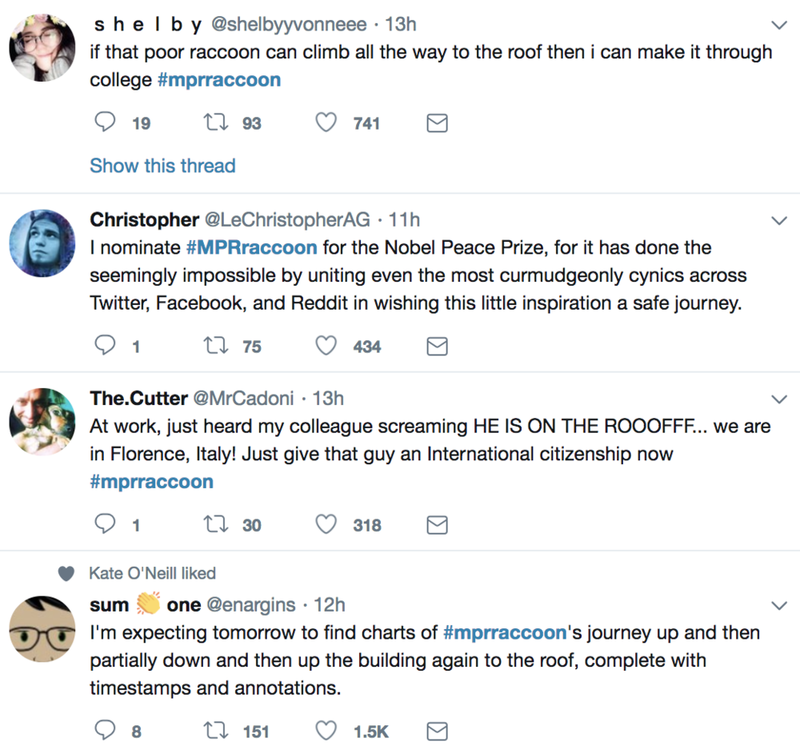 #MPRraccoon inspired people around the globe on topics ranging from completing college to world peace. In case you missed it, #MPRraccoon is the tale of a raccoon who was observed scaling the side of 25-story building in downtown Saint Paul, Minnesota. Quite literally, millions (billions? It was the top trending story on Twitter worldwide at one point) followed this furry little critter's harrowing climb up several hundred feet in the middle of a busy work day. (Thank you, social media) It was a unifying event that, according to many tweets, inspired observers across the globe. So what does this have to do with fundraising? Again, everything ...because online fundraising works best when you are able to catch potential donors at the right point in time. In most cases, we try to accomplish this by tying digital campaigns to established events we can anticipate. #GivingTuesday, national awareness days, founding anniversaries ...and that can be successful. But rarely are those events as inspiring as a sudden, viral Internet sensation. So how on Earth can you prepare for something as random as a miniature mammal taking center stage before the world? If you're an conservation or animal welfare organization, the answer should be obvious. Early the day after the #MPRraccoon hit the news, you should have had a social media campaign with promoted tweets and Facebook posts ready to fire. Emails should have been created and sent - a giving page with a screen grab of the raccoon and clear call to action should have been ready to go. The messaging? For animal rights orgs: "Not all wildlife achieves the fame of #MPRraccoon - give today to ensure happy endings for all those animals who aren't trending topics"
For the conservation org: "Don't force more raccoons up high rises - give today to preserve habitat for generations to come"
Use technology that allows you to build a content-rich online giving page in less than an hour. Most crowdfunding platforms allow for this. And develop a strategy that prepares your team - from major gift officers who secure matching gifts in less than a day (our clients have done this - it is possible if you've built the framework in advance) to content producers ready to turn on a dime to leadership who is comfortable with the pace. At Groundwork, we are doing agile fundraising for our clients right now and we have examples of how this has helped raise hundreds of thousand of dollars and hundreds of new major gift prospects. In fact, later this summer (2018), we'll be releasing a case study about our most recent agile fundraising campaign with one of our client partners. Click here to let us know if you'd like to be added to the email list so we can send you a copy when it's ready. Agile fundraising is not without it's challenges, but the opportunity that exists with this strategy is tremendous. Have you had success with agile fundraising or agile marketing for your nonprofit? If so, let us know in the comments! There is an amazing amount of powerful, game-changing technology on the scene today. Whether you’re launching a giving day, identifying online ambassadors, or engaging major donors around their social media behavior, in modern fundraising, if you want to do it there is probably a tool for it. But this embarrassment of riches has its challenges. First, there is option paralysis. In our efforts to continually improve Groundwork Digital’s services, I just did a search for “social media influencer platforms.” The first page of search results was littered with blog posts promising “25 best…” “40 best…” “57 best … influencer identification platforms!” Even artificial intelligence and machine learning now have multiple players in the nonprofit space with wonderful platforms like Gravyty and QuadWrangle continuing to expand their tool sets and client lists. Then, once you’ve made a decision and purchased software, do you have the talent to make the most of your investment? This is the issue that we so frequently see in the nonprofit and higher education spaces – amazing tools that are collecting dust on the shelf, because the fundraising teams either don’t know or don’t have time to learn how to use those tools. UConn has hired a position to focus on "business intelligence" and finding the best technology to lead their engagement and fundraising efforts. Hiring a technology expert is something we at Groundwork would recommend every large organization consider. Or, consider restructuring the responsibilities of your current team to better utilize technology your shop owns now or may soon acquire. Whether you’re hiring or restructuring a position, the following are talents and skillsets present in the right candidate to lead your nonprofit out of the dark ages and into an innovative and more efficient future. First and foremost, your new technology expert should be a top-level fundraising strategist. And they need to be more than a digital expert – they need to know multi-channel fundraising. Coordinated and aligned multi-channel fundraising campaigns typically perform best. That’s why your technology expert should know how email, direct mail, digital advertising, phone programs, and social media work together. A technology expert also needs to be more than an annual giving specialist. Perhaps even more important than online giving software are the increasing set of tools that make major gift work more efficient and effective. This is why your technology expert should be aware of what keeps gift officers and directors of development up at night. The tech expert should understand what is possible in terms of data capture and management and which platforms can make the most of your data as it relates to your most capable donors and prospects. Next, find an innovator to operationalize your technology. An “innovator” is someone who can think out of the box and reimagine your current technology suite. The innovator can also recognize how the right new platforms could transform your fundraising shop. This is particularly difficult to do with in-house staff as their ideas and concepts are intertwined with your existing approach. With technology, a fresh perspective can be tremendously helpful. Finally, you need unbiased ideas and recommendations. It may seem obvious, but you can’t turn to a tech vendor for tech recommendations. Oddly enough, sometimes the tech vendors are not even the best ones to actually sell you their technology. A vendor only knows your team so well. The full toolset, the politics, the capabilities of your team – all are important factors in selecting new technology and an internal team member or consultant who knows you well is in a far better position to select the right technology based on these factors. Between CRMs, websites, online giving technology, and a host of other platforms, your organization likely spends well into the six figures and possibly more on technology. This is a good thing, but also a substantial challenge. To make the most of this technology, you need a person or team focused on integrating the technology with your operation. Find someone who is equal parts fundraising pro and technology geek to take the reins of your tech and watch your operation grow because of their presence. Need help? Groundwork Digital leads technology selection and implementation projects for our clients. Click here to email us and learn more. Online giving days and events like #GivingTuesday are adding hundreds of millions of fundraising dollars to nonprofits every year. And this trend shows no signs of slowing any time soon. So it makes sense that nonprofits would be feverishly trying to find the best, most significant dates in their calendars to launch an inaugural online giving day. Or maybe improve a long-standing giving day. But maybe the organizational calendar is the wrong place to look for the right date for your giving day? Instead, shouldn't we be asking our donors - individually, in some cases - which date makes the most sense to them? 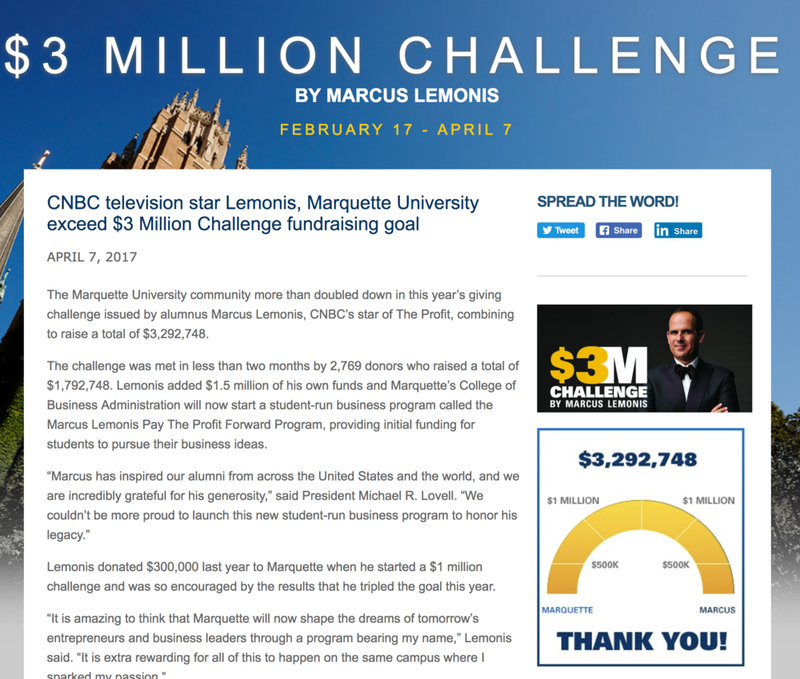 The $1 million Challenge launched in 2016 when Marquette alumnus Lemonis offered up a $300,000 match to spur giving at all levels. Using his enormous social media clout, Lemonis led the charge in tandem with the Marquette development team to raise more than $1 million, including Lemonis' matching gift. Lemonis and Marquette teamed up again in 2017, this time on a $1.5 million matching gift from Lemonis. The result? An additional $1.7 million raised in addition to Lemonis' match for a total of $3.2 million. The key to successful campaigns like Marquette's giving challenges with Marcus Lemonis is in finding your online ambassadors who also have major gift capacity. And they are out there. Right now Groundwork Digital is combining influencer screening with wealth screening to single out the big-time social media users with the capacity to give transformational gifts. But finding these large-gift-donor ambassadors is only part of the process. Next, work with gift officers and prospect development to enhance solicitation strategies with the newfound digital data on prospects. This step includes merging gift officer knowledge with donor info in the database plus the psychographic info pulled from the social listening data (the data that came about via the influencer scan). The goal is uncovering digital campaign concepts that match important aspects of a major gift prospect or donor's life. Birthdays, anniversaries, graduations - any life event could be leveraged to build an online campaign that has deep personal meaning to the donor or prospect. And that deep personal meaning translates into fervent online ambassador activity from the major gift donor or prospect. This major-donor-centered digital campaign could be short and intense like a 24-hour giving day or it could be longer duration, like a crowdfunding campaign. Regardless of the specific parameters, building digital fundraising events around a personal milestone or cause of a major donor can both lead to new major gift prospects from the donor's network and a significant boost in small-gift giving in support of the campaign. Meet with gift officers and prospect development to merge existing knowledge with new data from social media and online sources to create enhanced, hyper-targeted solicitation strategies. Leverage digital campaign opportunities as part of your ask to unlock big gifts from these digitally savvy donors. Innovative nonprofit Charity:water leverages personal events to build substantial online fundraising campaigns around celebrities and major donors. To be clear, the traditional online giving day is a tremendously effective fundraising and marketing tool for your organization. The exposure and excitement around broad-based giving days rapidly grow an nonprofit's culture of philanthropy adding new donors and enthusiasm to a development program. In addition to the traditional giving day model, consider expanding your digital fundraising by rethinking the giving day and adding a number of major-donor-ambassador-led campaigns throughout the calendar. Are you interested in finding digitally active major donors and prospects and working with them to launch huge online campaigns in 2018? Groundwork Digital is helping multiple clients do exactly that right now. Click here to send us your email and we'll be in touch on how we can help your organization rethink the giving day in the new year and beyond. Keep that in mind, then go look at the number of views you have on some of your strongest Facebook or YouTube videos. And imagine 60 percent of those views becoming donors. Technically, that should be the case. If only it were that easy ...or maybe it is? The following are three tips to build a video-driven content strategy that leads to your organization's strongest ever end-of-calendar-year fundraising push. Launch an end-of-year Facebook Live telethon. On New Year's Eve or the week before, invite your best supporters who are also digitally active (your online ambassadors) to a special end-of-year party. Be sure there are plenty of food, drinks, and entertainment ...and an experienced Facebook Live crew. During this event, conduct several interviews with attendees and have them talk about why they gave back to your organization in the previous year and why they will continue giving in the new year. You might also interview a person or two who has been positively impacted by your mission. This could be a student, a patient, or a dog-in-waiting to be rescued ...you get the idea. To increase the audience for your Facebook Live, make sure everyone you're interviewing shared the Facebook Live with their friends and family as soon as you go live. And of course, throughout the Facebook Live event, be sure to frequently remind donors they "can give to support your mission by clicking 'donate now' in the Facebook post. We call this the "modern Facebook pledge drive." For more details on how to conduct a Facebook pledge drive, click here to watch our webinar. You might have heard from various digital experts that lower quality, more authentic video is more effective for fundraising. At least in some cases, that's true. According to Thankview, lower-quality, webcam-recorded videos are watched to completion 61 percent of the time, while higher-quality, uploaded videos are watched to completion only 47 percent of the time. More importantly, webcam-recorded videos lead to call-to-action clickthroughs on an email link 15 percent of the time, while uploaded videos only lead to CTA clickthroughs 10 percent of the time. If you're sending 10,000 emails, that's an extra 500 people who go to your gift form from the lower-quality video. That's not to say high quality video doesn't have it's place. (Wait until you see what Groundwork is doing with virtual reality and major donors) But we should never avoid sharing videos with our donors, because we feel the quality is unbecoming of our mission. Can you see the video? Can you hear the video? If you answer "yes" to both and the message is on point, then share that video with your donors and prospects. Especially via year-end appeals. This approach will lead to more video messaging and, ultimately, more gifts. If you've experienced virtual reality, then you are aware of the medium's transformative power. 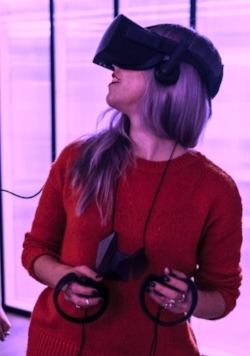 VR can place a person in a different time and space while giving them an emotional experience similar to being present (in the literal sense). Imagine using this technology to democratize your high-priced, end-of-year donor galas. Of course, nothing beats the real thing - actually being there - but for $50, a donor can experience the event virtually as opposed to paying $5,000 for a table. Access to watching the speakers, hearing the musicians, enjoying the celebrity keynotes... can all take place from the comfort of home and at a more approachable price point. This gives the annual fund donors unique access to high-end experiences without cheapening the experience for large gift donors, because the large gift donors still have the exclusive benefit of literally being there. This tactic could also be used as a leadership annual giving tool by moving the $50 up to $500. Especially if you're concerned about cheapening the high-price live gala experience. Using VR to widen the reach of a gala could be done through Facebook Live or could be recorded and edited for later use. For example, gift officers could carry VR headsets with them to donor visits and allow those who couldn't attend in person to watch the next best thing. Is your development operation ready to transform your fundraising outcomes with video? Groundwork Digital builds sophisticated digital strategies and produces award-winning videos for clients. Ask us about it by clicking here and completing our contact form. Facebook Live is a powerful tool that can instantly drive thousands of attentive viewers to your organization’s mission and message …when it is done well. Content, the right equipment, an energetic host – there are many factors to producing a game-changing Facebook Live event. 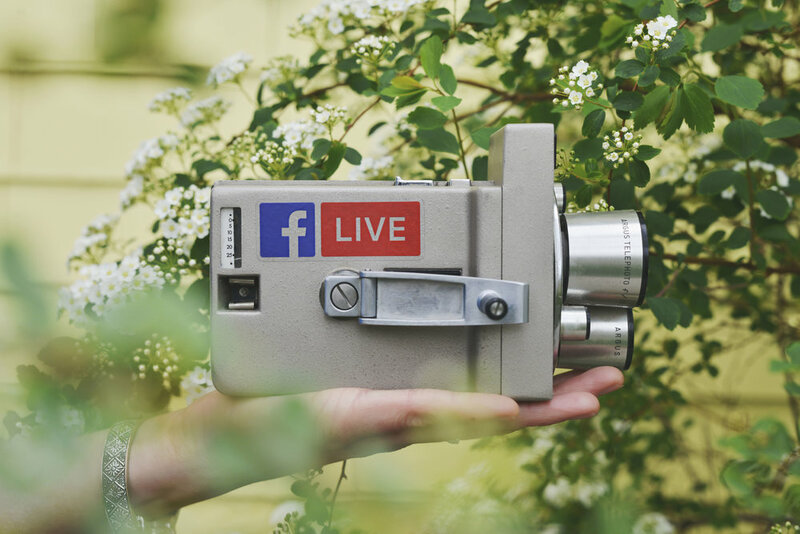 Below is Groundwork Digital's webinar, produced in partnership with Mighteor, that outlines how Facebook Live can be used to drive huge results for online fundraising campaigns. Enjoy! The Next Big "Giving Day"
Online giving events such as #GivingTuesday and org-specific giving days have changed the face of fundraising. Unfortunately, most fundraisers are leaving donors and dollars on the table during a giving day. The good news is, the experts at Groundwork Digital have the experience (more than four dozen giving days under our belts) to unlock those donors with proven tactics. Equally as important, we can help integrate your giving day into a year-round digital fundraising effort that revolutionizes donor engagement for your program. Groundwork currently offers this Giving Day Elevator package at the discounted price of $10,000. Click “Learn More” and give us you contact info. We'll get in touch to schedule a free, 30-minute consultation to determine if Giving Day Elevator is right for your operation. The for-profit world has been placing value in peer-to-peer influencers or "online ambassadors" for years. And the results show that trust in ambassadors is paying off for many companies. In fact, "trust" has a lot to do with why ambassadors are so effective in modern marketing and communications. What does that mean for donor acquisition? ...and retention? The fact is, online ambassador communication works just as well - maybe better - in the nonprofit world. In reviewing online ambassador activity that that took place on the ScaleFunder giving day platform in 2016, each ambassador would, on average, raise $125 during a giving day. Perhaps even more staggering is this 2015 Blackbaud study that found 1 in 4 emails from online ambassadors led to a gift - a whopping 25 percent conversion rate. That's compared to 1 in 1,250 emails from the organization that led to a gift - a paltry .08 percent conversion. Again, for those keeping score, that's a 25 percent conversion rate for ambassador-sent email versus a .08 conversion rate for emails sent by the organization. It almost makes you wonder if you should ever send a solicitation email that is not from an online ambassador? And it works for major donors, too. Check out the video below that details how the higher the price tag (a major gift, for example), the more peer influence impacts the decision. Now here's the catch - it's not easy. Online ambassador programs are volunteer programs and they require careful and frequent management ...but if you do it right, you have the potential to transform your development operation for the 21st century. And guess what? Groundwork Digital has built dozens of online ambassador programs. Click the "Contact Groundwork" button below to send us a message and set up a time to talk about how we can help revolutionize your development operation with peer-to-peer fundraising. At large institutions and organizations, the online giving day is a cacophony of activity. Annual giving, marketing, donor relations, the major gifts team, corporate relations... giving days are an all hands on deck extravaganza of fundraising activity. When done well, that means a giving day can have far-reaching impacts on many aspects of a development operation. For the University of Idaho, during the school's first giving day in 2016, the reach of the giving day extended to major gifts, student giving, and across the advancement team as a lightning rod that stimulated team building. In the video below, Stacy Rauch - Idaho's Associate Director of Development for Engineering - talks about how her team connected with major donors to secure challenges, engaged team members across campus, and led the communication blitz that led to big fundraising bucks. Groundwork Digital's team members have built many giving days, like the one detailed in the video above. To find out how Groundwork can help you launch your first giving day or expand your current giving day, click the the button below to schedule a FREE giving day consultation. Jill Jadon is the Co-Founder and Director of Operations for Groundwork Digital. A former Deputy District Attorney for the County of Los Angeles, Jill has since dedicated her time and energy to a number of educational and nonprofit causes. Jill oversees all operations for the company, including finance, HR, and legal. When not assisting clients and the rest of the Groundwork Digital team, Jill enjoys traveling to Europe, live music, and spending time with her husband and three children. The first year of crowdfunding is an exciting time. You launch your first projects and are excited about the new dollars and donors coming in. But where to find the next campaign? The answer is closer than you think. Groundwork Co-founder and Vice President, Rosa Conrad, talks about strategies to build a pipeline of crowdfunding projects. How do you continue to find projects for your crowdfunding programs?